Michael Adebolajo has launched a £25,000 claim against the Ministry of Justice, after complaining he lost two teeth when he was restrained by prison officers in HMP Belmarsh in July 2013, DailyMail reports. During the first day of the hearing today, Mr Justice Langstaff said Adebolajo ‘forms relationships easily’ and has ‘a large group of people’ looking after him in prison. Lawyers representing the Ministry of Justice said Abedolajo’s influence inside the jail is so significant that prison officers giving evidence at any trial could be in danger if their names emerged. The case is being heard in front of jurors at the Queen’s Bench Division of the High Court in London, where judges analyse damages claims relating to personal injury. ‘He forms relationships easily,’ the judge said. Fusilier Rigby, 25, died after being attacked by Michael near Woolwich Barracks in south-east London in May 2013. Mr Justice Langstaff said the incident at the centre of Adebolajo’s claim had occurred while he was awaiting trial for the killing. Five prison officers had been escorting Adebolajo, and physical force had been used to restrain him, holding him by the head and an arm. The judge said the use of physical force by prison officers had to be justified. The MoJ lawyers told the judge that prison officers were ‘deeply unhappy’ about being involved in legal proceedings. Mr Justice Langstaff said Adebolajo had not been given legal aid to pay for lawyers to represent him. He said Adebolajo might have to represent himself at any trial and suggested that it would be in the interests of justice if public funding could be given. ‘If and when this case comes to trial it will be a great pity to justice, and in particular the presentation of the claimant’s case, if some means were not found to ensure he had professional help,’ said the judge. Adebolajo, who is in his early 30s, and Michael Adebowale, who is in his mid-20s, were convicted of murder following a trial at the Old Bailey. The former was given a whole-life jail term, while the latter was sentenced to life with a minimum term of 45 years. 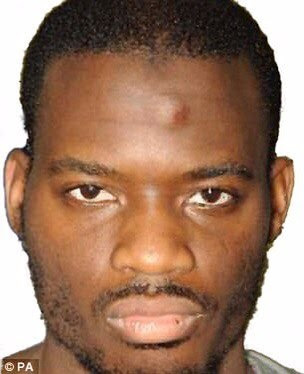 Adebolajo had screamed ‘Allahu akbar’ as he and Adebowale were sentenced by a judge at the Old Bailey in February 2014 after being convicted of Fusilier Rigby’s murder. The two British-born extremists, who were dressed in Islamic robes, erupted with rage as Mr Justice Sweeney told them that they had been radicalised and betrayed their religion. Both were pinned to the ground and bundled out of court by prison officers.